Today is Bob Dylan‘s 70th birthday. The outspoken “prophet” of the turbulent 1960’s has never ceased to be an enigma to many of his friends, and adversaries. 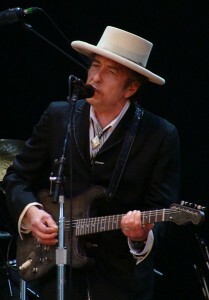 During the “Jesus Movement” Dylan found his way into a California Vineyard church and began studying the Bible. Dylan attended a course held at the Vineyard School of Discipleship, which ran four days a week over the course of three months. Somewhere in the mid-1980’s Dylan became disillusioned with at least institutional Christianity and distanced himself from public proclamations of faith. Regardless of Dylan’s own personal faith (or lack of it) today, he has left a body of work exploring the Christian faith that is well worth considering. Israel Wayne is an author and conference speaker who writes on cultural issues from a Biblical worldview. I have yet to see or hear any definitive evidence that Mr. Zimmerman has left the faith. It may be wishful thinking on my part (my last conversion experience came in high school while listening to Saved) and still love his music. But one continues to hear at least elliptical allusions to the faith in his more recent music. Deciding to be more coy and not making such direct albums is not a repudiation of the faith. Thanks for this Israel, and happy birthday Mr. Zimmerman. Great article, Israel. What an amazing thing to consider a journey like his, saturated in the secular music world, and yet still recognizing his Savior. I agree with the previous poster that even though he may be keeping his faith silghtly more veiled nowadays doesn’t mean he doesn’t still have that saving faith. Perhaps it’s a self-preservation mechanism for the world in which he operates.